June 12, 2015 - Allegiant Air, a low-cost airline owned by Allegiant Travel Co. on Tuesday prevailed before the United States Court of Appeals for the Ninth Circuit in its appeal of a lower court ruling which had prohibited the Company from changing the terms and conditions of employment for its pilots. The unanimous appellate court decision held that the lower court erred in finding that Allegiant had to maintain the "status quo" while it negotiates a contract with the pilots' representative, the International Brotherhood of Teamsters (Teamsters), pursuant to the Railway Labor Act (RLA). 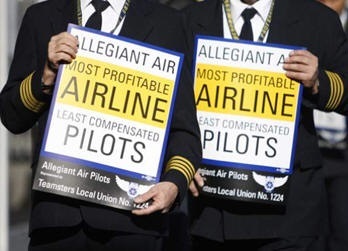 The Teamsters was elected to represent Allegiant's pilots in August 2012. In late 2013, the Teamsters sued the Company, claiming the Company had violated the RLA's "status quo" requirements by allegedly making changes to established pilot work rules during the parties' negotiations. The appellate court concluded that Allegiant has no obligation to maintain the status quo under the RLA during its negotiations with the Teamsters. It vacated the injunction and remanded the case to "permit the Teamsters and Allegiant to continue negotiating a collective bargaining agreement in conformity with the RLA and under the [National Mediation] Board's guidance." Allegiant's chief operating officer, Steve Harfst said, "We are pleased with the Court's ruling and look forward to directing our time and energy to the negotiating table to continue working toward a contract that will be beneficial to both our pilots and the company".